Despite the fact that when it comes to meat I only eat fish and fowl, I still own plenty of cookbooks with lots of recipes for red meat. So, with most cookbooks when I arrive at a meat chapter, I imagine coming back to those recipes some day when we have people visiting or maybe when I want to surprise Kurt with a beef dish for his birthday. They become the ‘’sure, maybe, one of these days” recipes. When I started reading my review copy of A Bird in the Hand , I quickly realized how unusual and refreshing it was to have a cookbook in which 100% of the recipes were made with meat that I personally would eat. In Diana Henry’s new book, every single recipe is one I’d want to try. Some are quick and easy for weeknight meals, others are grander for parties, one chapter is just for chicken salads, and another is all comfort foods. There are classics, takes on classics, and chicken dishes from all around the world. I tried the Vietnamese Lemongrass and Chile Chicken made with chopped, boneless chicken thighs, and it was a burst of great flavor. I can’t wait to try the Royal Chicken Korma, the grilled Chicken Piri Piri, and Negima Yakitori skewers. At the end of the book, there’s even a chapter for what to do with leftovers. I’d love to have extra chicken in the refrigerator to use in Chicken, Date, and Lentil Brown Rice Pilaf with Saffron Butter. For the salad posted here, I took a few minor liberties. After marinating the chicken, it could have been cooked under the broiler. Instead, I fired up the grill to add more smoky flavor and roasted the bell pepper on the grill as well. I also used fresh, local green beans rather than the snap peas suggested. The most important part of the recipe was the marinade that was also used in the dressing, and I didn’t change that one bit. The marinade was a mix of hoisin sauce, soy sauce, dry vermouth, orange juice, five spice powder, seeds from cardamom pods, minced garlic cloves, and strips of orange zest. Chicken breasts were covered with the marinade and refrigerated for several hours. To use excess marinade for the dressing, it’s later boiled and reduced to a syrup. I actually reduced enough to use for both the dressing and to baste the chicken while grilling. I grilled a bell pepper until charred, let it cool, peeled and seeded it, and cut it into strips. I used green beans and blanched them before draining and rinsing with cold water. Halved shitakes were sauteed in olive oil. The chicken was grilled and basted then allowed to cool before slicing. For the dressing, some reduced marinade was mixed with olive oil, lime juice, and some honey. Typically, when a dressing recipe includes honey or maple syrup, I skip it. Here, a little honey really brought everything into balance nicely. Without it, the dressing was a tad salty. 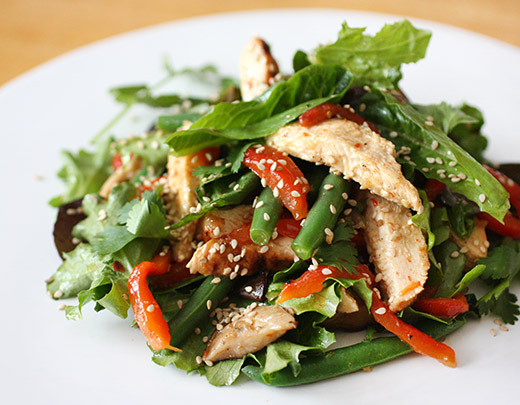 To finish, mixed salad greens were tossed with the sliced chicken, bell pepper, shitakes, green beans, cilantro leaves, and dressing. The plated salads were sprinkled with sesame seeds. This is a perfect meal for salad season as I like to call the hot months. The dressing is a nice mix of big flavors that work well with the lingering smokiness of the chicken and peppers. I also discovered that some leftover slices of this chicken were great on a sandwich with more greens. I won’t stop reading all sorts of cookbooks, but I do love knowing that every page of this one is fair game. So to speak. Recipe reprinted with publisher’s permission from A Bird in the Hand . 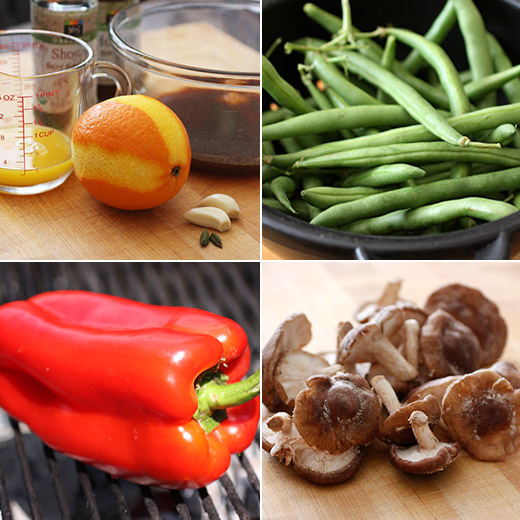 Combine all of the ingredients for the marinade. Put the chicken in a dish and pour the marinade evenly over it. Cover with plastic wrap and put in the fridge for a couple of hours, but ideally 24 because this really will improve the flavor. Bring it to room temperature before cooking. When ready to cook, preheat the oven to 350 degrees F. Halve and seed the bell peppers and put them into a small roasting pan. Brush with a little of the regular oil and roast them in the hot oven for about 35 minutes, or until tender and blistered. Once cooked, cut into slices lengthwise. If it looks as though the skin is about to peel off you can remove it. Sometimes I do, sometimes I don’t. Preheat the broiler to high. Lift the chicken out of the marinade and put it on a foil-covered broiler rack (the foil really just helps make it easier to clean later). Cook under the hot broiler for 12 minutes (6 on each side), brushing every so often with the marinade. Cook the sugar snap peas in boiling water for 1 minute, then drain and run cold water over them. Heat the tablespoon of regular oil in a skillet and quickly saute the shitake mushrooms until they are golden. Reduce the marinade by boiling until it is syrupy. To make the dressing, mix 3 tablespoons of the reduced marinade with the 3 tablespoons of virgin oil, a good squeeze of lime juice, and a little honey (both to taste). Slice the chicken diagonally and toss with the leaves, the warm dressing, strips of bell pepper, sugar snaps, shitakes, and cilantro, if using. Throw on the sesame seeds and serve. Hi Lisa, oh my husband likes anything with hoisin sauce, was looking at the reviews for that cookbook today.......was undecided whether to buy it or not. Looks like I will now. Have a great week! That salad looks so tempting! I love that marinade. What a fabulous recipe! The vibrant vegetables take center stage with a wonderful dressing! I've thought about this cookbook and was pleased to read your review. I actually see recipes with meat and fish and find them inspiring even though I don't eat them because I can vegeterianize them and turn them into something I can eat! This sounds like a great cookbook, especially if this salad is any indication! diana henry is AWESOME! though i don't do it intentionally, i find myself sticking to chicken and turkey with the occasional pork or ground beef, so new ways to make chicken exciting are always welcome! That's a terrific looking marinade! So much flavor. 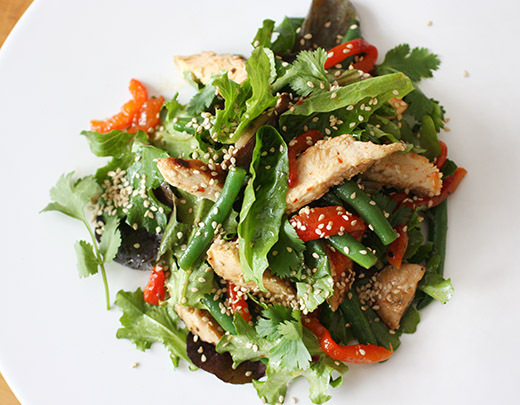 And this salad is so perfect for the summer -- totally satisfying, and not too heavy. Looks super -- thanks! Your salad looks delicious - and perfect for the summer. Love your variation on what already sounded pretty amazing! That marinade does sound to die for! Beautiful salad, Lisa. Sounds delicious, especially that marinade!